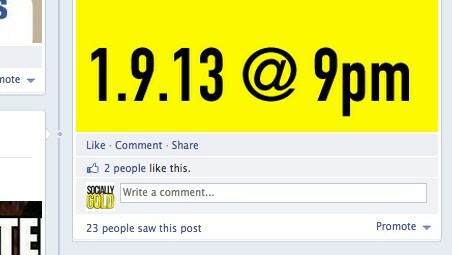 If you aren’t worried about your Facebook engagement…you should be. As I wrote about earlier, Likes, don’t matter. Engaged fans do. Facebook applies an algorithm called Edgerank in which it prevents you from seeing every update from every friend and every page you like, in order not to “overwhelm” you. This algorithm can prove difficult for marketers in that all your posts aren’t seen by all your Fans. 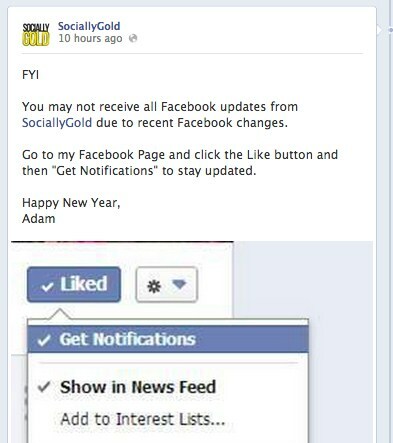 At the time of this post, SoiallyGold has 453 Likes. 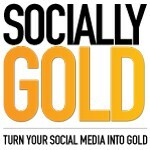 I posted about the 1st #SociallyGoldChat all about social media next Wednesday. In the image below, you’ll see that only 23 users saw it. Depressing isn’t it? I was very careful of the wording that I used in this post. I was deliberate not to use words like “all posts” and “receive all notifications” as those words may overwhelm your audience. 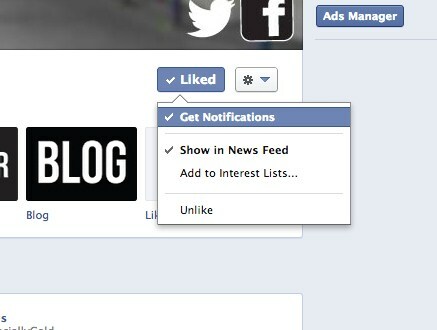 Encourage your fans to get notifications every time you post and watch your engagement sore. It’s also worth posting more then once at different times of the day to make sure a high amount of your fans see it. Are you going to try this technique to increase your engagement? Let us know in the comments.